Despite the drastic changes along Broadway below Union Square following the Civil War, Judge James Roosevelt refused to budge. Commercial buildings replaced the fine old homes around his as his wealthy neighbors moved northward to Murray Hill and Fifth Avenue, yet the judge stayed on in the house he had built in the 1840s. Roosevelt was a member of one of the oldest and most prestigious families in New York. He had further distinguished the name as a Justice of the Supreme Court in 1851, United States Attorney for the Southern District of New York and a member of Congress. But finally, in 1875, James Roosevelt died in his house at No. 836 Broadway; one of the last surviving residences in the neighborhood. Within a year the venerable house and its neighbor at No. 838 had been razed and a new commercial building was going up. Mitchell, Vance & Co., manufacturers and designers of light fixtures, clocks and bronzes, and ornamental metal work, had commissioned esteemed architect Stephen Decatur Hatch to design the new building. The firm was established in 1854 and by now was a leader in the industry. The wide array of items offered by Mitchell, Vance & Co. required extensive showroom and office space. Over 600 workmen and artisans worked in the factory and foundry on 10th Avenue between 24th and 25th Street. To satisfy the needs, Hatch produced a wide, spacious cast iron structure six floors high that terminated in a stylish, steep mansard roof. 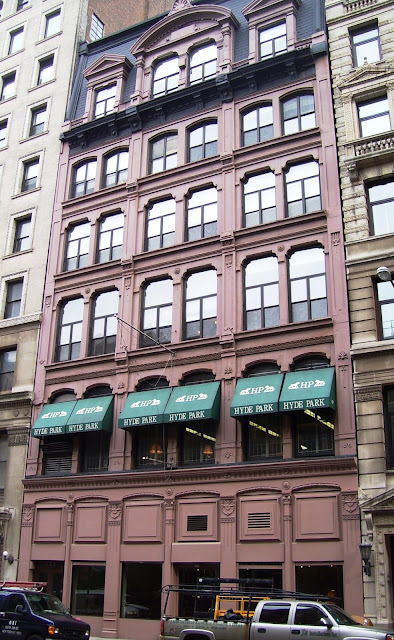 Begun in 1876 and completed a year later, the L-shaped building had a side entrance on West 13th Street. Despite Mitchell, Vance's own high-end clientele and the exclusive nearby emporiums that also catered to New York’s carriage trade, the architect did not over-embellish. In fact his understated iron façade has a nearly-industrial feel. Regimented rows of windows and mostly-unadorned pilasters gave little hint of the elaborate and costly items for sale inside. Only the fish-scale covered mansard with its attractive dormers gave an aristocratic touch to the design. And yet the façade, taken as a whole, presents a dignified and upscale presence. The Mitchell, Vance & Co. Building was the first modern building on the block. “New York’s Great Industries” remarked that “Their showrooms, salesrooms and offices occupy the entire six-story double building, Nos. 836 and 838 Broadway…The amount of floor space in the establishment is thus enormous, and yet it is none too large for the immense stock here gathered together, and which forms the best exposition of their lines of goods ever presented to a discerning public. The showrooms make a most magnificent display, and which is a great attraction both to citizens and visitors to the city. Within a decade electricity would begin making inroads in the lighting field. Mitchell, Vance & Co. was the pioneer in the electrical lighting area. When Thomas Edison was still engaged in his Menlo Park experiments, he turned to Mitchell, Vance & Co. for his first permanent lighting fixtures. By 1884 electrical lighting fixtures were a major part of the firm’s offerings. The new technology was a tremendous boon to the company. By now it had illuminated the first private residence lit by electricity, the J. Hood Wright house; as well as the mansions of J. W. Doane of Chicago and Marshall Field; the Murray Hill Hotel and the Hoffman House; the Minneapolis Opera House and the “Dakota Flats” facing Central Park, among many others. The firm's cast fixtures were well-designed and executed. Financial problems forced the company to reorganize and cinch in its belts. In 1890 Samuel B. H. Vance—who had also been Mayor of New York—died. That same year the company was leasing space to apparel companies as the dry goods and millinery district engulfed what had formerly been solely high-end retail buildings. Another firefighter, Ladderman George Knecht plunged two stories to the pavement when he was hit by a falling part of the building. In the freezing temperatures, the water from the fire hoses froze as it hit the building and it took five hours to extinguish the fire. In the end there was over half a million dollars in damages. “The building was wrecked and the stocks of seven firms destroyed,” said The New York Times. Philips, Anderson & Co., where the fire started, was a complete loss. J. Goldstone & Company, makers of cloaks and suits lost its entire stock as well. The same was true of Heller & Company. The Pioneer Suspender Company, the Savoy Shirt Company and the Heath Krises Company who made felt hats were all heavily damaged. But it was Mitchell Vance Company that was hit the hardest. An insurance agent on the site estimated the loss at around $200,000—just under $4 million today. The company was insured for only $125,000. Despite the devastation, the structure was rebuilt. Stephen Decatur’s “fireproof” façade was just that. It survived intact. Within months even Mitchell Vance Company was back in operation from its old headquarters. The new tenants continued to come from the garment and millinery industries. Crown Suspender was here in 1908 and Phillips, Anderson & Co. was back in the building, doing a brisk business in the straw hat trade. The company would remain here until 1911 when a fire destroyed its factory. Early in December 1921 the Roosevelt family sold the building at Nos. 836-838 Broadway to “a cotton merchant” after having owned the property for over three-quarters of a century. 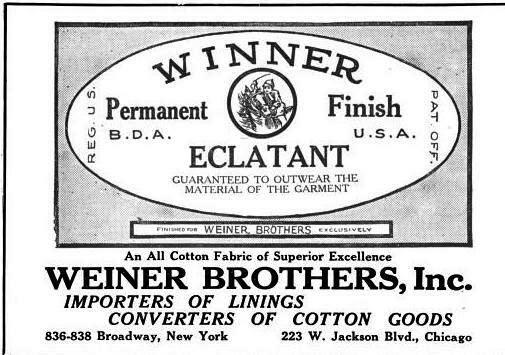 The building continued house garment firms including the Zeeman & Grossman Bros. Company, manufacturers of young men’s clothing, and the Velvet Sample Card Company. By the 1930s the garment district had moved upward to Broadway and 7th Avenue and Nos. 836-838 Broadway saw a variety of tenants. Among these in 1950 was the J. Beeber Company, makers of surgical and medical equipment. That year the firm donated ten short-wave diathermy machines and other medical equipment to the new state of Israel and to the National Side Fund of Palestine. Today the building is little changed. No modern shop fronts have obliterated the street-level iron work; although the original expansive showroom windows have been reduced in height by half and the attractive entrance doors are gone. Home to, among other concerns, the NYU Press, Stephen Decatur Hatch’s subdued Victorian design has withstood the onslaught of time, fire and change. that is a wonderful photo. It's not the James Roosevelt house, but one of a relative and -- you're right--very nearby. Thanks a lot! Very nice posting with some beautiful photos. Thanks for sharing your information. Any one know what ever happened to the New York Elks Lodge #1 lights and chandeliers that were in there big building on 43rd street. The Mitchell Vance CO. I am told to have fitted that lodge many accoutrements. Is this true and where did it all go to after they were kicked out of there own building??? Any answers I'm a jmcdrums@aol.com Thank you! What ever happened to Mitchell, Vance & Co.? Are they still in business?